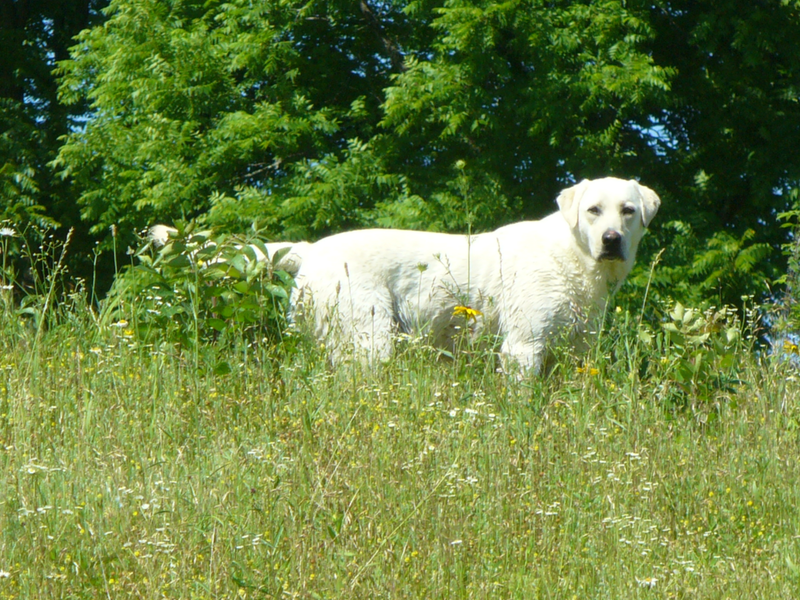 Bullis Lake Labradors specialize in white labrador retrievers that are intelligent, happy, healthy and conform to the breed standards. 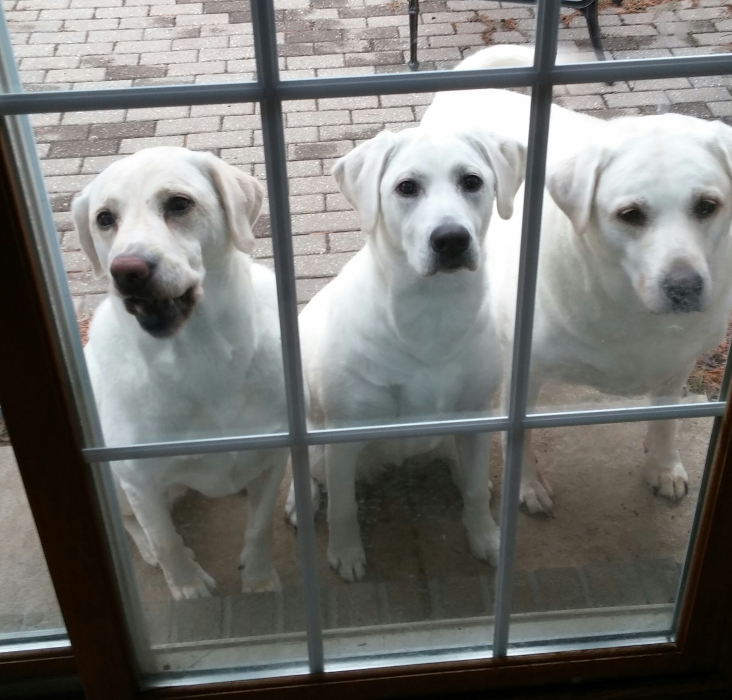 White labs are very light yellow labradors. We are inspected by the American Kennel Club and the inspection reports are posted on our website. All of our property is fenced so the dogs can run free and be dogs. 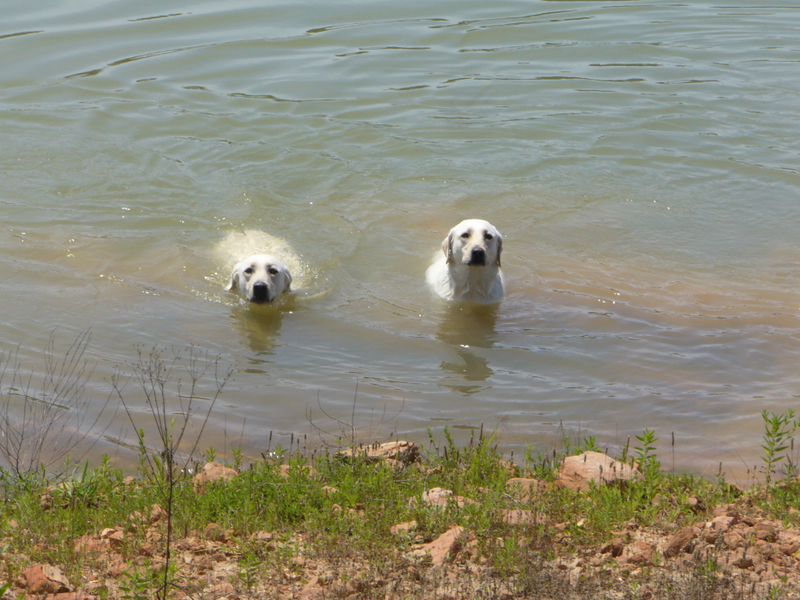 There is a 3 1/2 acre lake on our property and Labs do love their water! I do not have any human children, so my dogs are my family. All mothers deliver their puppies in my house and the puppies stay in the house the whole time they are at Bullis Lake. I let the mothers decide how long they want to stay with their puppies. Some mothers are done when their teeth come in, some mothers stay with their puppies until the puppies leave here at seven to eight weeks. Please check out our extensive website that contains lots of information, pictures and links. Thank you for considering us as a source for your next family member. Do not hesitate to write us an email or give us a call with any questions you may have. 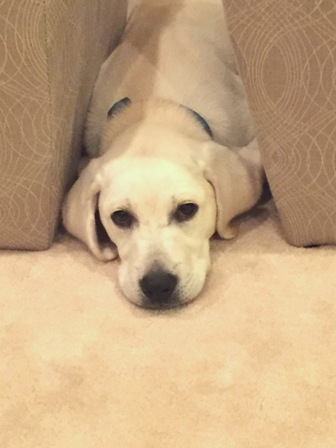 Want to message Bullis Lake Labradors? Send him or her an email by filling out the form below! Bullis Lake Labradors will reach out to you when he or she recieves your message. Jeff - Posted over 2 years ago. Janet - Posted almost 3 years ago. 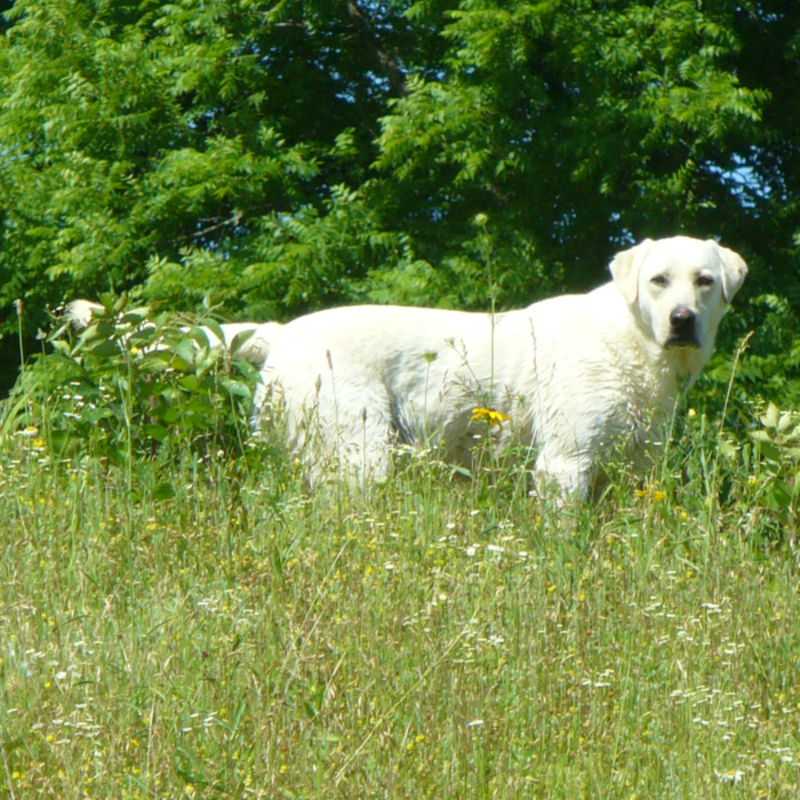 I have known Alan and his beautiful dogs for several years, even before he started Bullis Lake Labradors. I help Alan with his dogs by bathing the puppies before he takes pictures of them for the website, clean the kennels, sweep up the dog fur in the house, etc. Basically, I do anything I can do to help with the dogs and puppies. Alan does not have any children and his dogs are his family. He has fenced his whole property so the dogs can enjoy playing and running off leash safely. After several years helping with the dogs and puppies I decided I needed to have one for myself, so I purchased a puppy. Her parents are Candy and Blizz and she is the most beautiful and happy dog. She is smart and fun and thinks she is a lap dog. When I am able, I would love to have another one of Alan's beautiful dogs. Denise - Posted almost 3 years ago. Melissa - Posted almost 3 years ago. Hi Alan, Just a quick note to let you know that I am doing great. I continue to love picking up everything in my path. Rocks are fun. Leaves can be quite chewy. Sticks are really fun. My family loves it when I pick up sticks during a walk. A few things I love to do just to keep my family on their toes are: grab a bite of our lilac bush each and every time I go outside or come back in; Go for a walk. Almost every single person I pass stops and tells me I am cute and pats me. Many times I flop over on my back and they laugh and laugh. I don't know why, but they seem to think this is funny. It's fun here in Bar Harbor as there are a lot of tourists so every time we go out we meet someone new. I hope things back in Illinois are well. My mm said that you have been to Bar Harbor before. If you come back, make sure you stop by and say hello! Melody - Posted almost 3 years ago. I cannot say enough good things about Alan and Bullis Lake Labradors. 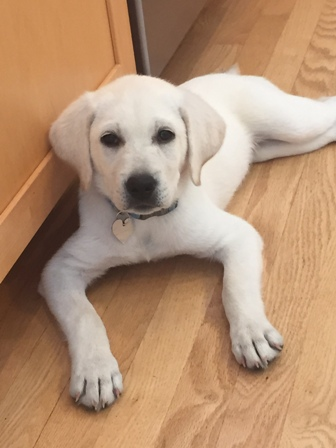 I met Alan before he started Bullis Lake Labradors and am familiar with the over-the-top provisions he has put in place to be able to offer such fantastic, healthy, beautiful labradors for sale. Alan is one of the most loving and caring dog owners I’ve ever met and he always makes sure his dogs are well-cared for at all times, ensuring a happy, healthy life, full of plenty of exercise, and top-of-the line veterinarian care. 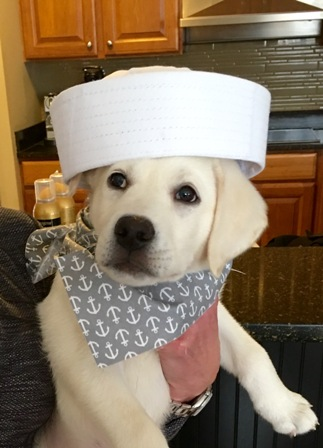 I knew when Alan started his business venture of Bullis Lake Labradors and seeing his commitment to excellence that I would some day buy a puppy from him and have bought two so far. These two precious labradors, Katie and Neptune, sister and brother, are the most fantastic companions we could ever ask for, always happy, healthy, and full of energy and devotion, very attentive, smart, and a complete joy to have in our families. Thank you Bullis Lake Labradors. 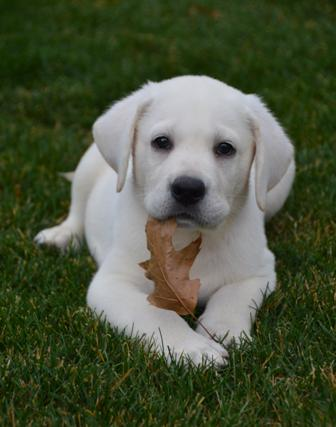 I originally went to this breeder to get a puppy for my neighbor whose yellow labrador had recently passed. In the puppy picking process and excitement I ended up getting a puppy as well. They're super great companions. My neighbor is very happy with Katie and I couldn't be happier about Neptune. The dogs are full of love and devotion and ideal companions. Paul - Posted almost 3 years ago. Mike - Posted almost 3 years ago. Jodi - Posted almost 3 years ago. SearchBreeders - Posted over 3 years ago. 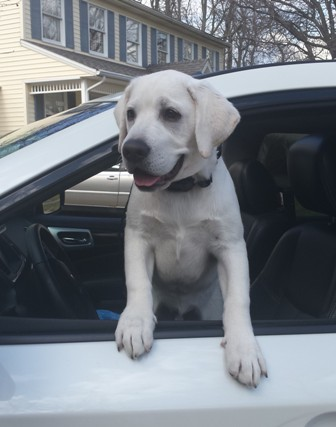 SearchBreeders Review: We were asked to investigate an experience with one of Bullis Lake Labradors customers. This customer purchased a puppy with hip problems, and after some back and forth, was eventually refunded his money and kept the dog. Because this was the only puppy to exhibit these health conditions, Bullis Lake Labradors did not at that time, cease breeding the parents. It is our understanding that these parents are no longer being bred. While it is unfortunate the dog suffered from those health problems, ultimately it seems no other dogs have had similar issues, and Bullis Lake Labradors did in fact honor their health guarantee.